The most remarkable thing about living on the northern central plains is the astonishing relationship between the sky, the landscape, and the light. There is nothing more bracing than a clear bright sunlit forty below day in the middle of winter -- when the light seems ethereal in its brilliance against the whiteness. Terry Fenton's paintings are works about light; or about its absence. He paints the sky and the simple earth below in the rapture of the light as it passes through the seasons and the weather. He has been painting on the back roads and the countryside immediately around the region where I live and travel while thinking about the poems that I habitually turn into books. We have been covering the same ground south of Saskatoon, only recording it in different media -- mine, words on paper; his, oil paint on paper. When I look at his paintings I feel a powerful attraction -- they understand the essence of this place in time, distance, light, and space. I marvel at the sunset painting, L'Heure Exquise, on the cover. It is a variation of a scene I witness many times each year on the back road five miles west of Dundurn when we go out in the evenings looking for deer. The sudden sensation of light having recently left the foreground is strangely disturbing as change quickly alters the balance and the moment is transformed into an astonishing abstraction. Fenton's works are pure and persistent in portraying the powerful force of light on a subtle landscape. They invoke memory and let me see the light again in ways that inspire me to think about ideas and how they might be best illuminated in the countryside of the imagination. 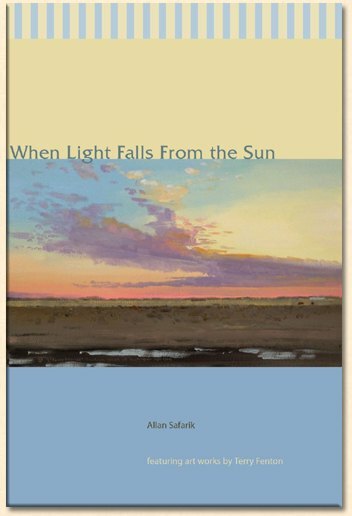 Many thanks to Paul Wilson of Hagios Press for thinking of my paintings in connection with Allan's poems and especially to Allan for writing such fine poems and for his kind and perceptive words about my art.